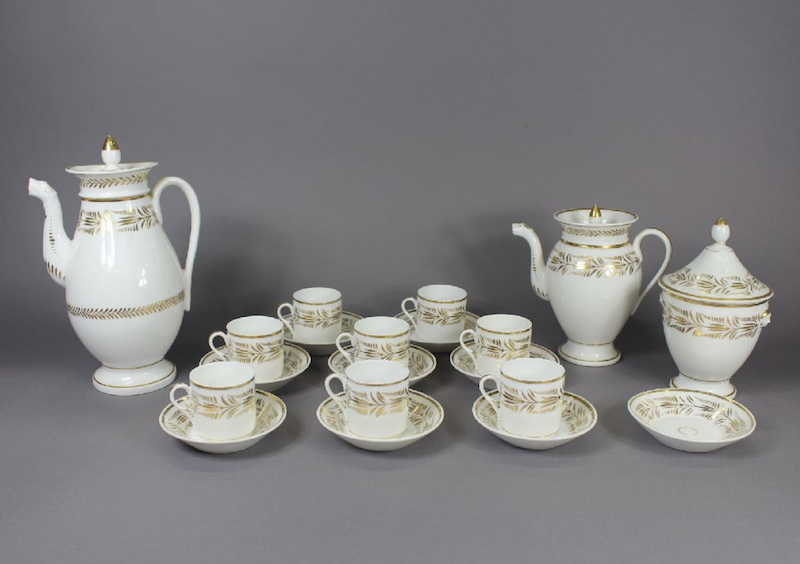 This French Empire style, Restauration period, service has a coffee pot, hot milk (or tea) pot, vase shaped sucrier, and seven cups and nine saucers. The non-inverted pear shaped coffee pot is a form made by very few of the Old Paris factories, Locre being the most likely contender. The set is unmarked, like nearly all the porcelain made within the walls of Paris, by about 30 manufactories, between the C1770s and the 1860s. The cups are the straight sided citron shape, familiar to English Georgian porcelain collectors as "coffee cans". This suggest an early date the 10s or 20s, rather than the 1830s onwards. There is some damage. Small chip to smaller pot rim. The gilding is in pretty good condition with very little wear. The finial of the sucrier lid has been reglued. The large pot is 28 cm tall. $1250 the lot, so cheaper than being the individual pieces separately. This French Empire style, Restauration period, service has a coffee pot, hot milk (or tea) pot, vase shaped sucrier, and seven cups and nine saucers. The non-inverted pear shaped coffee pot is a form made by very few of the Old Paris factories, Locre being the most likely contender. The set is unmarked, like nearly all the porcelain made within the walls of Paris, by about 30 manufactories, between the C1770s and the 1860s. The cups are the straight sided citron shape, familiar to English Georgian porcelain collectors as “coffee cans”. This suggest an early date the 10s or 20s, rather than the 1830s onwards.